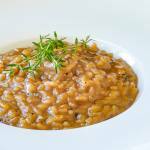 French Onion Risotto – a video recipe. Easy French Onion Risotto. This video recipe dispels the myth that risotto is difficult to prepare. A little time and patience are all that ‘s needed and practically no skill at all. 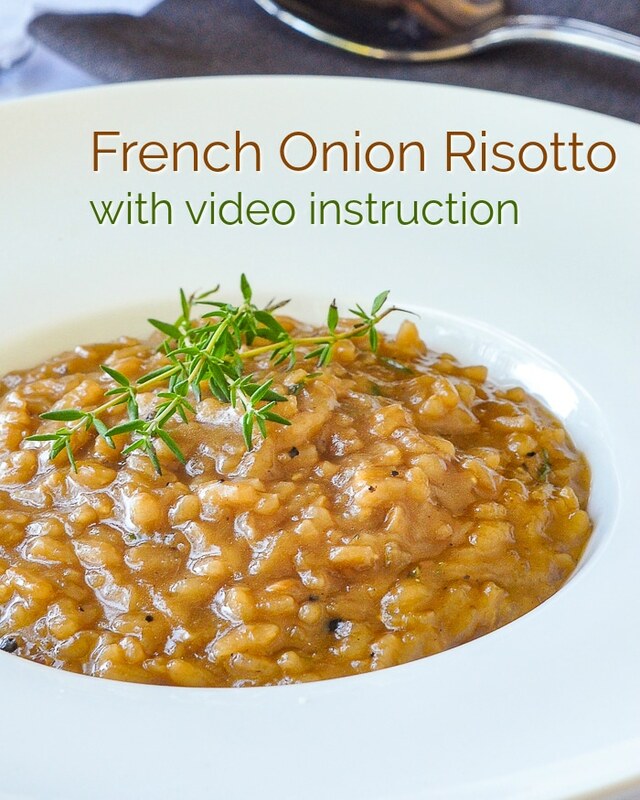 Let’s face it, making risotto scares the heck out of some people but I’m out to change that by putting together this recipe for French Onion Risotto with a short video to show just how easy a basic risotto can be to make. A great risotto is not about skill at all in my opinion but more about patience and time. If you are the type of cook who likes to rush things, slow down, relax, and give this risotto a gentle touch. Risotto is going to take a minimum of 20 minutes to cook after all the ingredients have been assembled. This one will take longer because it uses slowly caramelized onions as the flavor base which can’t be rushed either. Check out the video below to see the process of gradually adding the stock and wine to the rice. Stir, stir, stir! The time it takes to slow stir this risotto to perfection is well worth the effort though and for me is a meal in itself or served with some simple grilled scallops, shrimp or chicken that takes far less time. This recipe takes it’s inspiration from one of Spouse’s favourites, French Onion Soup and translates it into a deeply flavourful, creamy risotto. I think this makes the perfect appetizer course at a special dinner; just choose a main course that can be prepped in advance. I would probably caramelize the onions in advance too, just to get an extra jump on preparing this beautiful, simple dish that’s sure to impress your dinner guests…just let them think that risotto is difficult and that you’re the master. Like this French Onion Risotto recipe? 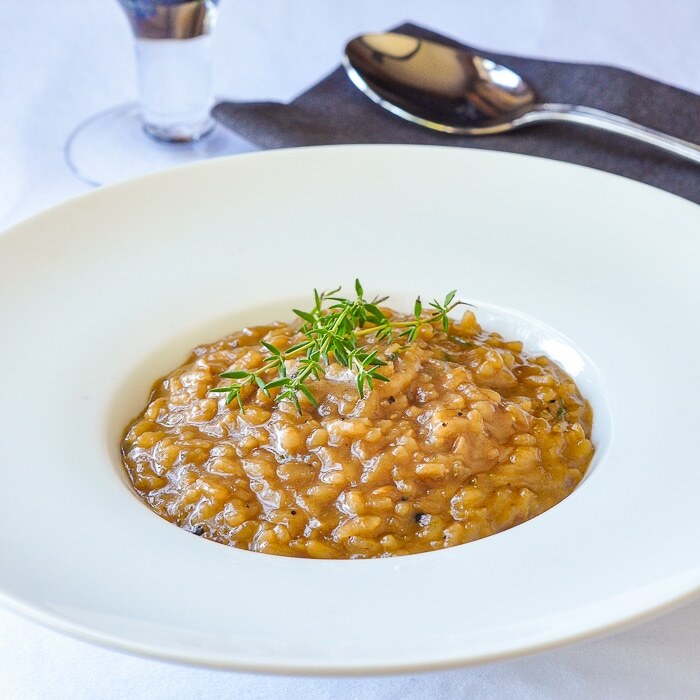 Inspired by French Onion Soup, this simple recipe shows that risotto is not that difficult to make after all. Add the beef stock and red wine to a small saucepan and bring to a very slow simmer. Maintain the stock at a boiling temperature. While the stock heats, add heat the oil over medium low heat in a separate saucepan and add the onions. Slowly saute the onions for about 10-15 minutes until they slow turn a golden color. Don't rush this stage. season with a little salt and pepper. Stir in the garlic and then add the rice. Saute together for 3-5 minutes to completely coat the rice. Add one cup of the stock/wine mixture and stir in. Adjust the heat so that the risotto very slowly simmers. Continue to stir the risotto constantly as it begins to thicken. After about 5 minutes, when the risotto begins to thicken add another cup of the stock/wine mixture. Repeat this process about 4 times. Taste the risotto to see if the risotto is fully cooked and to see if the risotto needs any more seasoning. Add a little more stock and continue to stir if the rice is still a little hard. Add the fresh thyme and cheese and stir in until smooth. Add the butter here if you would like to add a little extra richness to the risotto but that's completely optional. I have not found the secret of opening your recipes. Help please. But you are commenting on this post. You opened this one. Nobody is reporting issues with the site and we have tens of thousands of people here every day. I made the French Onion Risotto last night. It was scrumptious! It took a lot longer than 20 minutes for it to cook, though. I wonder if I started it with the heat too low? I’ll crank it up at the beginning next time! Thanks for the inspiration. My DH certainly enjoyed tucking into the risotto after his 12-hour day yesterday! So glad to find you and this great risotto idea ! Will be back. Thank you ! As with all of your recipes that I’ve tried the risotto is amazing. I’d like to make more next time. Just wondering if you’ve ever doubled this recipe, I know that does not always work well with some recipes.